The survival rates for breast cancer are high, and many American women are living decades beyond their diagnoses. 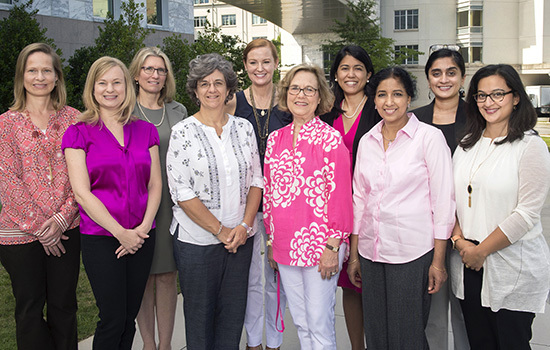 Because so many women survive breast cancer, Winship researchers and physicians are focusing on improving the quality of life for them. A third of breast cancer survivors face serious side effects such as fatigue, depression, and surgery- and radiation-induced breast and skin problems, which can be so devastating that some women consider them worse than their breast cancer treatment. What if doctors could predict the patients who are most likely to suffer post-treatment problems? The Glenn Family Breast Center at Winship is answering that question through research discoveries that are a direct result of philanthropy. Chemotherapy works by damaging the DNA in cancer cells but it also leaves an imprint on the DNA of a patient's blood cells. Studies have linked genetic changes caused by chemotherapy to inflammation, which is considered a major cause of symptoms like fatigue. Research undertaken by the Glenn Family Breast Center has taken that one step further and is the first to identify the connection between chemotherapy and the way genes in non-cancerous blood cells turn on or off to cause inflammation. "Through these discoveries, we are closer to predicting who will experience fatigue, depression, cognitive dysfunction, skin toxicities, and other morbidities, and we can determine how to fix problems through traditional and alternative treatments," says Mylin Torres, director of the Glenn Family Breast Center and newly named recipient of the Louisa and Rand Glenn Family Chair in Breast Cancer Research. Identifying a genetic marker related to persistent inflammation could benefit patients through treatment strategies and follow-up care designed to minimize side effects. Torres, a radiation oncologist who has studied fatigue in breast cancer survivors, leads this research with Andrew Miller, William P. Timmie Professor of Psychiatry and Behavioral Sciences, whose research focuses on inflammation and chronic diseases. Torres and Miller joined forces with support from the Cooper Family Foundation, which was attracted to the possibility of meaningful improvements for breast cancer survivors and began giving in 2006. "We started from nothing and grew and grew," Miller says. "The Coopers' funding was the push in that direction." Discovery funding like the Coopers' enables promising ideas to get off the ground and attract highly competitive funding from the National Institutes of Health, Susan G. Komen, American Cancer Society, and Radiation Therapy Oncology Group (now part of NRG Oncology). "Extramural funding helps us make innovative discoveries, get on the map of the cancer world, and attract national and international leaders to Winship," says Torres. "Advancing the field of breast cancer by conducting practice-changing research is the mission of the Glenn Family Breast Center." Read Winship Magazine feature, "Beyond the Pink Ribbon."